Our most popular Echo is now even better. With a new speaker and design, Echo Dot is a voice-controlled smart speaker with Alexa, perfect for any room. Just ask for music, news, information, and more. You can also call almost anyone and control compatible smart home devices with your voice. Use your voice to play a song, artist, or genre through Amazon Music, Apple Music, Spotify, Pandora, and others. With compatible Echo devices in different rooms, you can fill your whole home with music. Also listen to Audible, podcasts, radio stations, or pair with Fire TV to voice control movies and entertainment. Make your life easier at home. Use your voice to set timers, add items to lists, and create calendar events and reminders. You can also check the news, weather, or traffic. Ask for sports scores, movie showtimes, restaurant hours, or information. Switch on the lamp before getting out of bed, turn on the coffee maker on your way to the kitchen, or dim the lights from the couch to watch a movie—all without lifting a finger. Control multiple devices with a single voice command, like locking the doors and turning off the lights at night. Learn more about over 10,000 compatible smart home devices, including lights, thermostats, TVs, and more. Call almost anyone hands-free using your voice. 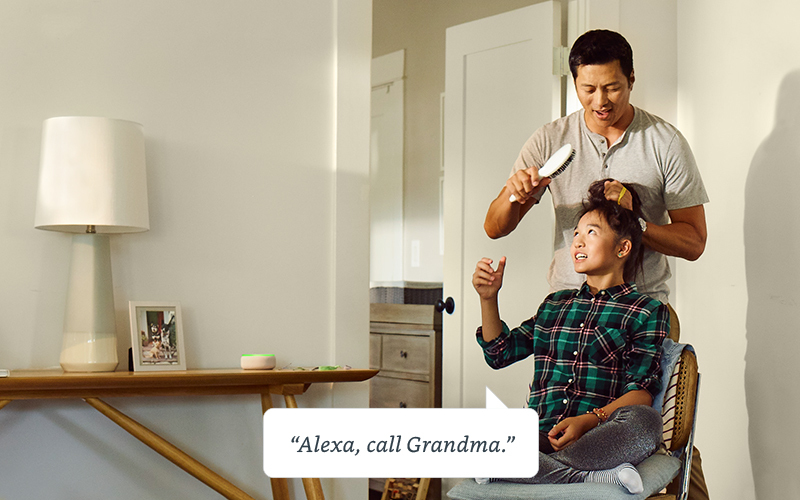 Use Drop In to instantly connect to another compatible Echo at home or send an announcement across Echo devices, like calling the family for dinner or reminding the kids to go to bed. Plus, now with Skype calling stay in touch with friends and family in over 150 countries. When you are running low on household essentials, Alexa makes it easy to refill your fridge or replenish your pantry. You can add everything from AA batteries to zucchini noodles to your shopping list, reorder favorite products from Amazon, or ask Alexa the status of your recent orders. New skills are being added all the time. Discover them in the skills section of the Alexa app or visit the skills store. © 2019 PRG Photo Shop. All Rights Reserved.